Brussels-headquartered hospitality major Carlson Rezidor launched its third property in the city, when it opened the doors of Radisson Blu Atria Bengaluru on Saturday. The upper up-scale hotel has been set up in partnership with Bengaluru-based A.S.K. Brothers, which has invested a sum of around Rs 100 crore in renovating the earlier Atria Hotel into its present form. The new hotel features 167 guest rooms and suites which boast of modern amenities, apart from four food and beverage outlets — One Atria Café, Tijouri. The Whiskey Bar and Tea and Wine Lounge. The hotel has over 1,250 sq metres of flexible room configurations with its six meeting spaces and two boardrooms, capable of accommodating large gatherings. Other facilities available at the hotel include the Business Class Lounge, business centre, swimming pool, spa, and a fully-equipped fitness centre. “Travellers don’t want in-the-face opulence, but a place to comfortable place for some good rest,” he added. 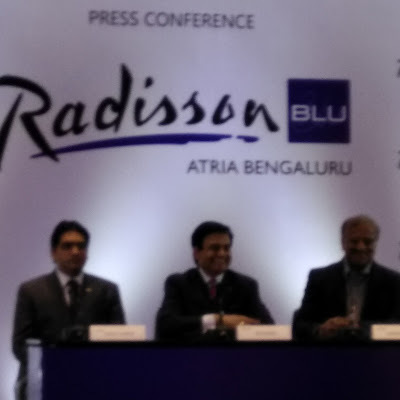 “The opening of Radisson Blu Atria Bengaluru is a testament of our footprint in the region and a reflection of the unique brand identity that we bring to the city,” said Raj Rana, CEO (South Asia) at Carlson Rezidor Hotel Group.